You asked, GFB delivered. A full sweet of GFB Blow Off Valve Accessories. Whistling Trumpet – A replacement trumpet that gives a different sound. Screw-in Block Off – If you have a GFB blow-off valve with two outlets and want to plug one of them, this is the plug to use. It replaces either a trumpet or recirc outlet to effectively disable the venting port. On Hybrid valves for example, it is used to change from 50/50 to full atmosphere or full recirc venting, by plugging the appropriate outlet. It is also commonly used to plug the trumpet outlet of the Stealth FX and Deceptor Pro in order to pass roadworthiness examinations, by preventing the valve from “easily” being adjusted to atmosphere-venting. 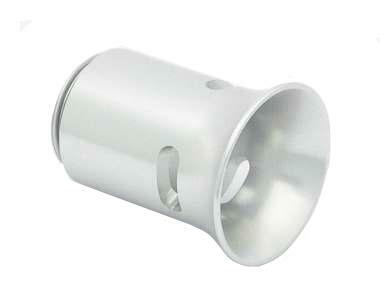 Inlet Adapter – A large range of different sized screw-on bases for hose and pipe mounting universal blow-off valves. Outlet Adapter – A range of different sized screw-on plumb-back (recirc) fittings to suit all universal blow-off valves. Hose Plug – Used for blocking off unused plumb-back hoses with full atmosphere-venting blow-off valves. Weld-on Adapter – Available in a range of different materials and sizes for use in applications where the blow-off valve requires a fitting to be welded to the turbo plumbing. Springs – Adjust the pressure of your BOV with a softer spring.